Sitting on one of the most hallowed grounds in the NFL, football has been played at the location of FirstEnergy Stadium since 1946. The history of the Browns in the NFL dates back to 1950, when the team joined the league from the All American Football Conference. From their inception they played at the cavernous Cleveland Municipal Stadium. Built in the early 1930s, the stadium had a seating capacity of 78,000 and was also home of the Cleveland Indians (MLB). Municipal Stadium hosted many memorable Browns games, but by the late 1980s and early 1990s it began to physically show its age. Both the Browns and Indians wanted new modern stadiums in order to generate additional revenue. Owner of the Browns, Art Modell, proposed that a new stadium be built. The Indians succeeded, constructing a new stadium and after the 1993 season they moved into Progressive Field in downtown Cleveland. However, the Browns were stuck with the monstrous Municipal Stadium. The City of Cleveland wanted to renovate Municipal Stadium but the Browns wanted a new state of the art facility. On November 16, 1995, after failing to reach an agreement with the City of Cleveland to build a new stadium for the Browns, Modell announced that the team would move to Baltimore after the 1995 season. Browns football was a tradition that could not be lost in Cleveland. In 1996, the City of Cleveland and the NFL secured a deal to return the Cleveland Browns, as an expansion franchise, to the city by 1999. The deal stipulated that the name, colors and heritage of the Browns would remain the same. Meanwhile Cleveland Municipal Stadium was demolished. On May 15, 1997, construction on a new stadium began on the same site of Cleveland Municipal Stadium. Cleveland Browns football returned to the City by the Lake on September 12, 1999 when the Browns played their first game at the new stadium against the Pittsburgh Steelers. 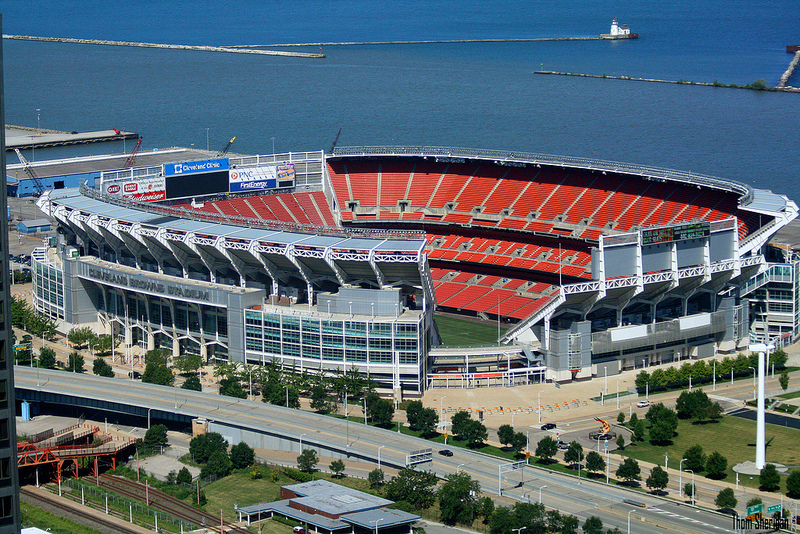 For 13 seasons the stadium was known as Cleveland Browns Stadium before being renamed FirstEnergy Stadium in January 2013. The structure of the stadium consists of two three-tier grandstands on both sides of the gridiron. A section of bleachers known as the “Dawg Pound” is located at the east end of the stadium. Additional seating is located behind each endzone. Architectural gaps in the seating bowl at FirstEnergy Stadium at the Southeast and Southwest entrance plazas allow visitors to view the field and the inside of the stadium even when the Browns are not playing. Excellent views of downtown Cleveland and Lake Erie can also be seen from inside the stadium. These gaps also prevent wind swirls that were prevalent at Cleveland Municipal Stadium. Several amenities are located at the stadium including the Browns Hall of Fame, team store and Legends, a sports grille. Two video/scoreboards are located beyond the seating area behind the endzones. 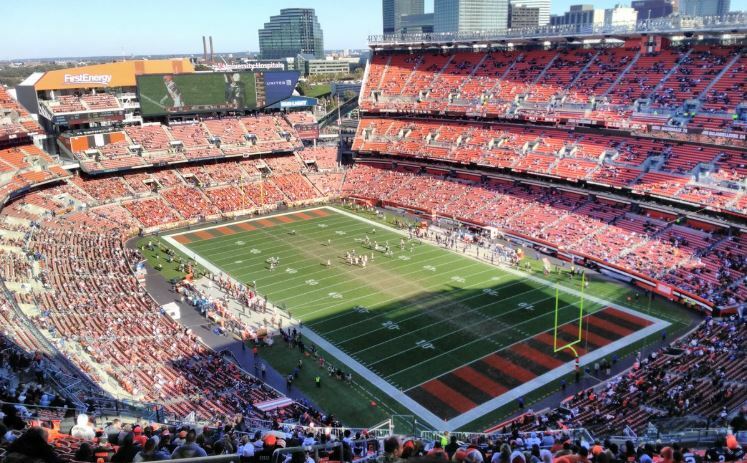 In November 2013 the Cleveland Browns unveiled a $120-million project that modernizes FirstEnergy Stadium over two years. The first phase of the project, completed by the 2014 season, included new HD video/scoreboards that are three times larger than the previous ones. Nearly 4,000 seats were removed from the lower deck to enhance the lower-bowl experience for fans, decreasing the seating capacity from 72,000 to 68,000. Additional escalators were also added to improve flow to the upper concourses of the stadium. The second phases, completed by the 2015 season, updated all concessions through the stadium (that include Michael Symon’s B-Spot, Chris Hodgoson’s Downtown Dog and Rocco Whalen’s Great Lake Cheesesteaks), upgrades to the concourses that includes better lighting and murals/artwork, and extensively remodeled the club level that now includes Club 46, a new field-levee hospitality area that is located directly across from the Browns locker room. With these renovations FirstEnergy Stadium is now on par with the newest state-of-the-art stadiums in the NFL.